multiple-choice questions on each text. ACTIVITY 151: You are going to read one extract which is concerned in some way with dance. For questions 1-2, choose the answer (A, B, C or D) which you think fits best according to the text. Then check the correct answers. Henry kneels to settle his valuables in a front-wall corner of the squash court. 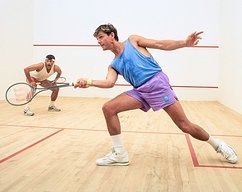 There's a momentum to the everyday, a Saturday morning game of squash with his good friend and colleague, that he doesn't have the strength of will to interrupt. He stands on the backhand side of the court and his opponent, Jay, sends a brisk, friendly ball down the centre, automatically Henry returns it. back along its path. And so they are launched into the familiar routines of a warm-up. The third ball Henry mishits, slapping it loudly into the tin. A couple of strokes later he stops to retie his laces. He can't settle. He feels slow and encumbered and his grip feels misaligned, too open, too closed, he doesn't know. He fiddles with his racket between strokes. Four minutes pass and they've yet to have a decent exchange. There's none of that easy rhythm that usually works them into their game. He notices that Jay is slowing his pace, offering easier angles to keep the ball in play. At last, Henry feels obliged to say he's ready. Since he lost last week's game he is to serve. This is the arrangement they always have. B. the game of squash. A. he accepts that he is not going to play well against Jay. B. he realises that Jay is getting impatient with him. C. he doesn't want Jay to think he's reluctant to start the match. D. he knows that Jay will not enjoy being beaten.